The windows on the lower part of the caboose are like regular windows; they appear to be made as a wood frame window, then put into an opening. The windows on the cupola are different; they're pieces of wood and glass fitted into the openings. I did several things different in an effort toward durability. First, I used pressure treated wood only. Second, I redesigned the layout of the boards, to prioritize the vertical over the horizontal. This was done by making the side boards fit the opening, with the horizontal boards between those. The bottom board has a bevel on its outer top edge, like a window sill at a house. Third, I made an end grain treatment to paint on the ends of the boards, so that water won't soak in. I've been observing rotted exterior wood for several years now, trying to deal with the rain water that gathers and hangs on the bottom of vertical boards. I have pictures showing conclusively that it's this hanging water which causes the most rot to certain structures. I tried devising ways to shed this water. I was once told that fringes on leather jackets are to draw water, not merely for appearances. It makes sense, as the fringe becomes the lowest point that water can travel to. I wondered if one could make a product that attached to the lower backside of a row of boards, a product that came on a roll, and had small fringes attached to it. The problem is that it would be trouble to attach to the wall, and anywhere that the fit wasn't perfect, that's where the rot would be. Then I thought of an easier and therefore lower labor cost way of doing the same thing; one gets a staple gun with long stainless steel staples, and drives them partially into the bottom of the boards. This seems fairly simple, but what if the end grain of the boards had something soaked in and dried before any rain was ever encountered? That would be a sure method, and the easiest to apply. The next question is: what product to use? Linseed oil or Shellac would probably work for awhile, but I don't know about their compatibility with modern finishes. I thought about how tough the new 100 percent acrylic water borne finishes are; then decided upon thinning that type of product down, and letting it soak into the end grain. What's really nice is that it's the same paint used to paint the faces of the boards, so it's completely compatible. That's the red you see on these boards. Below is a picture of OSB board in the opening. I drive in some temporary nails, which give me something to push the OSB against. Then, from the inside, I nail in the four boards that keep the glass from falling inward. This arrangement makes a quick way to be sure all the holder boards are aligned on a flat plane. After the inside boards are in place, I remove the OSB, and go to the outside. I put the glass in, the measure and nail in the four outer holder pieces. In the picture below, you can see some tools in front of one of the openings. 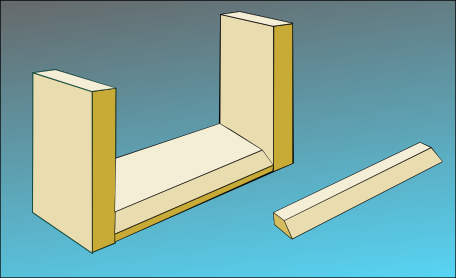 At the left, leaning against the yellow plastic mitre box, are two boards held together by a spring clamp. This is my measuring device. I've never been good at using a tape measure in an opening like this, so I slide these apart, and when they fit in the opening, I clamp them together. This gives me a perfect measurement. I use a ball point pen for marking, as it makes a very thin line. This measuring was used to cut the thin wood that holds the glass in. This measurement can make an airtight fit of the four mitered boards. In the mitre box is a hacksaw, the backsaw I brought that day didn't fit the box very well. `The caulk is used after the glass is in place, under the thin trim pieces.